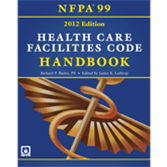 Apply the new 2012 NFPA 99 correctly and confidently with expert insights and visuals in the Health Care Facilities Code Handbook. With a shift to a risk- vs. occupancy-based approach; updates to medical gas and vacuum system content; new chapters on security, fire protection, and information technology; and other major changes, you're bound to have questions about the 2012 NFPA 99: Health Care Facilities Code. Don't risk confusion or mistakes that could jeopardize patient, staff, and facility safety. Consult this essential Code companion to get up-to-speed on new requirements fast so you can do jobs correctly, comply right the first time, and protect lives. 500+ full-color tables, photos, and other visuals that clarify concepts. Starting in 2012, NFPA 99C will no longer be a stand-alone document. Instead, NFPA® provides 3 options. NFPA's 2012 Medical Gas and Vacuum System Installation Handbook with all the latest rules for Category 1-3 systems plus expert insights, examples, and visuals that help you understand and apply them correctly.